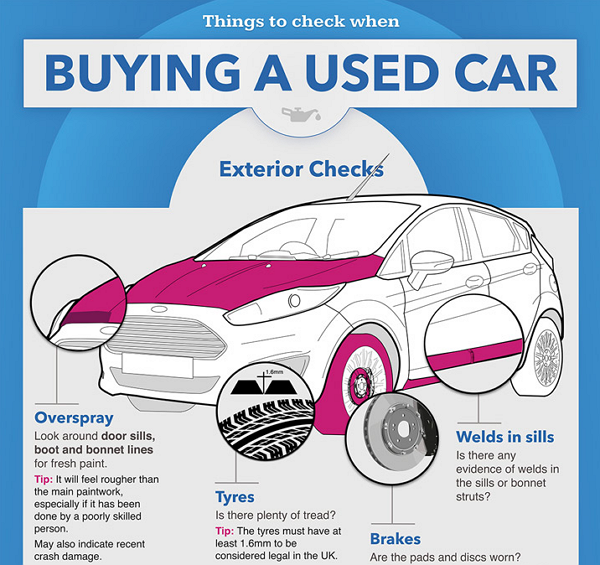 Top Tips for Buying a Used Car. We are all witness to a declining market of people purchasing new cars, but this only means there is going to be a rise in the sale and purchase of used cars. Any large purchase is daunting, but buying a used car comes with its own set of concerns. 1. Set a budget. Whether you have money saved for the purchase or need to obtain a loan, take a hard look at your budget and factor in tax rates, insurance and interest as applicable. 2. Do your research. Whittle your search down to a few makes and models; then, peruse the classifieds, dealer websites and online car listings to seek out the best deal. 3. Ask the seller for the VIN Chassis and engine number, and then get a REVS check done on the car before even going out and seeing it. you will want to know if the car has any money owing on it, or has previsouly been a write off. 3. Inspect the car on a sunny day. Poor lighting and inclement weather hide a lot of imperfections. 4. Ask about service history. All cars require work, but used cars will likely need some maintenance or fixes sooner rather than later; service history includes any garage bills, purchased parts and the schedule for routine maintenance. 5. Take a test drive. Gauge whether the car is comfortable for you to drive and then take note of any sounds, hesitations or issues on startup. be sure to do a few full 360 degree hard turns in the car as well. 6. If you don't know that much about cars or feel uncomfortable have an inspection done on the car by NRMA or another trusted provider. 7. Don't be afraid to negotiate the price, and if there are issues and you are still happy to buy the car use these issues as a bargaining point. 8. When purchasing ensure you get the sellers license number, and a signed printed receipt, along with any RMS paperwork. Buying a preowned car can often feel like a shot in the dark, but with these tips for buying a used car you'll be well on your way to making a sound, solid purchase! Sign up today and book your next trip with LifeSocial! LifeSocial is Free to Join and Use.